Leather in accessories is hot, hot, hot! I think I've said this before, but it's worth repeating. If you want to make chic jewelry that's in demand now, consider incorporating some leather into your designs. Leather is a wonderful material to work with and pair with your art beads. 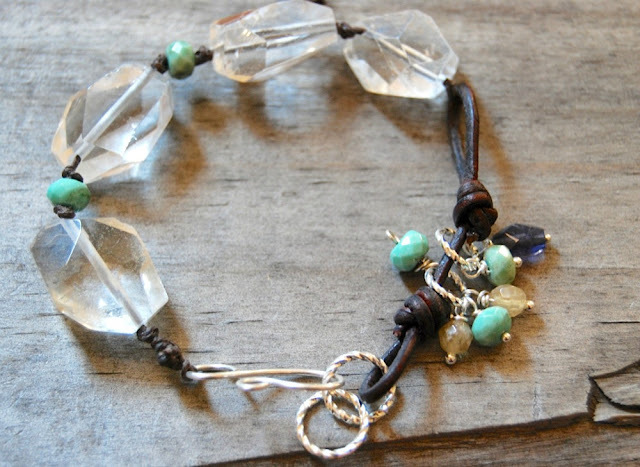 It adds lots of texture and interest to your jewelry. My stylish friend and book contributor, Tracy Statler is currently offering a video tutorial on how to make these fun leather infinity links. These components are a versatile way to add leather to your jewelry. 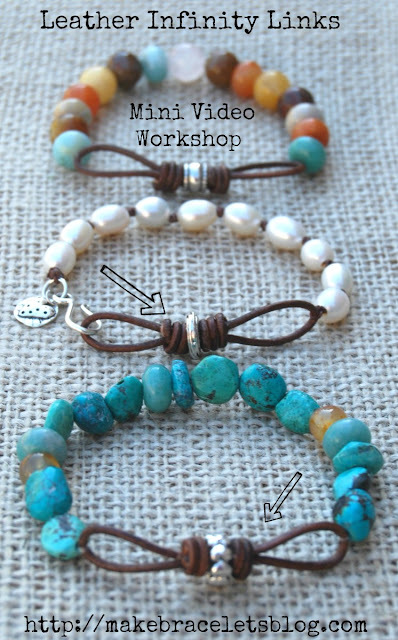 Incorporate them into bracelets, necklaces and even earrings. In this video tutorial, Tracy takes you step-by-step through the process of creating her innovative beaded leather infinity links. She also provides you with a handy supply list and helpful tips and tricks to make creating these cool components much easier. Tracy is available for questions and support, if you need help. She does allow designers to sell jewelry that is created from her tutorial, which in my book is a huge plus and very generous! There's even an option to pin and share your designs on a Pinterest gallery board that Tracy has created specially for those that purchase her tutorial. That's a great way to connect, share and promote your jewelry! 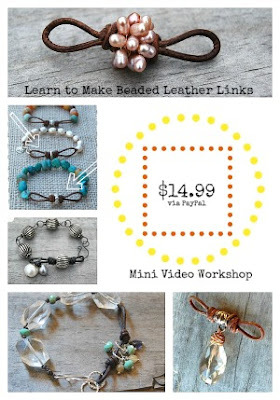 You can purchase Tracy's video tutorial through her blog, Make Bracelets! I highly recommend that you check it out. Oh, and as if you needed any more eye candy or convincing, below are more examples of Tracy's work showing the versatility of her leather technique. If there are any jewelry designers to keep your eye on, it's this girl. She's a phenomenal, high-quality designer that enjoys sharing professional tips and tricks, knowledge and supply resources, teaching and writing jewelry-making tutorials and how-tos. What more could you possibly ask for? 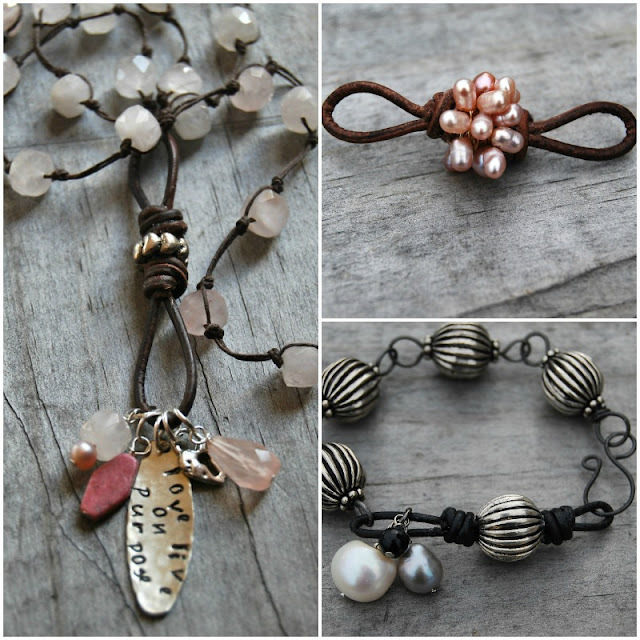 Do your-jewelry-making-self good and join her on her blog here. I hope you enjoy her inspiration. I know I do! I ordered this tutorial the other day. I recommend it. It is really detailed and clear. There are so many ways to use these great links!